Though it is a tough day for me with my nifty positional shorts. signals. As i decided to keep my stoploss near 200min EMA(2880). But here are those intresting signals.. 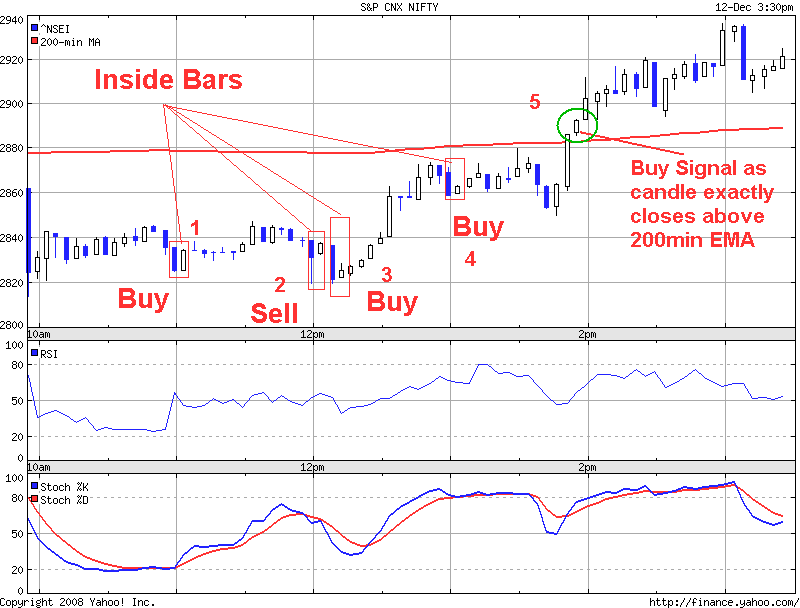 Inside Bars are the most commnly signal i often found in 5 min intraday nifty charts. the third candle closed below the second candle then is a clear short term sell. 5)But i feel little bit happy as 200min MA(2880) offers little bit resistance for some amount of time and clearly now nifty is facing resistance near 200min MA(2880). Though for a long time nifty is struggling in facing resistance near 200min MA. Though Europen markets open weaker as expected our nifty started moving towards 200min MA and breaches. 6)I simply exited my trade…and still feeling bad about my todays performance and behavior of not respecting technicals. i m tracking nifty options performance on ur charts. if u have back tested can u tell me how effective it is and whch time frame?